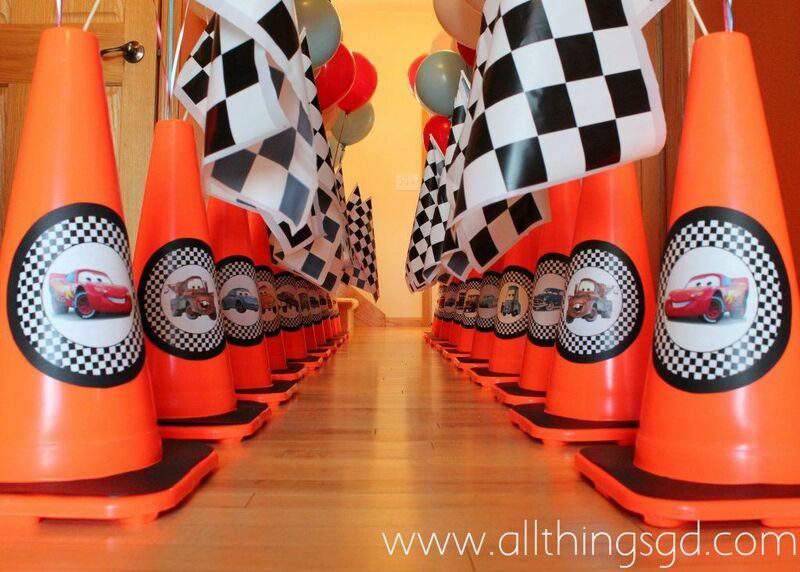 Kate’s Cars Themed Birthday Party! 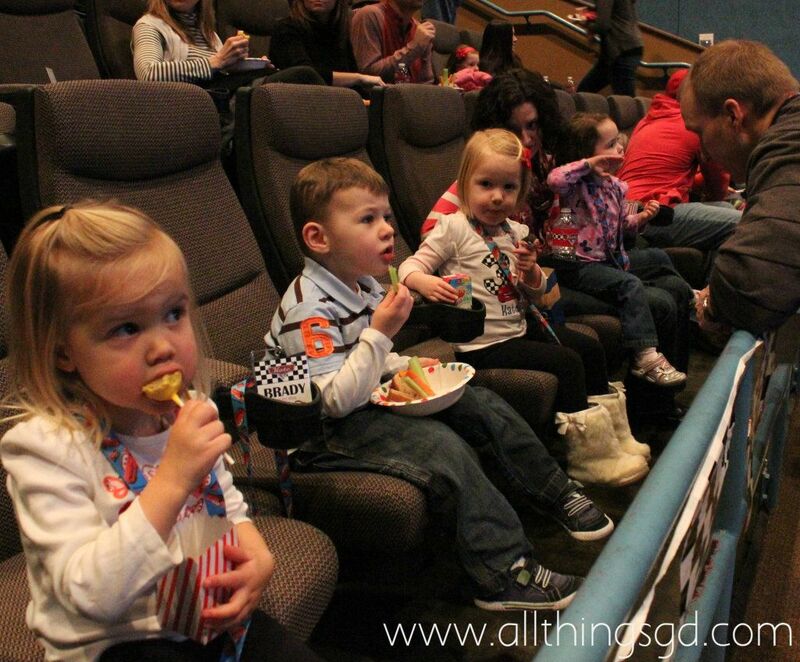 One of mine and G’s favorite things to do before Kate was born was seeing movies in the theater. Ever since her very first viewing of the 20 minutes that is Elmo’s World, we’ve been waiting for the day that Kate was ready to wait in line with us to purchase three tickets to the next Pixar flick and a $20 bag of popcorn (all for her, of course). Wouldn’t it be neat if the first movie Kate saw at the theater was her favorite movie, Cars? I wonder if Disney has any plans to re-release Cars in theaters this winter? Wouldn’t it be awesome if we could just rent out a theater and make them play our daughter’s favorite movie for us? We could invite everyone we know! And make cute little car-themed food! We wouldn’t have to clean the house!!! Now all I needed was to successfully pitch it to G. I tried not to get my hopes up (too) high because this is the guy who’s always telling me not to go overboard and who almost didn’t allow Kate’s first birthday party (which ended up being totally awesome; just saying). BAM! My flame was fanned and I began my mission to find a movie theater we could rent that would play a movie that was released six years ago. It was a surprisingly difficult feat, but I finally found a place, and the party was on! 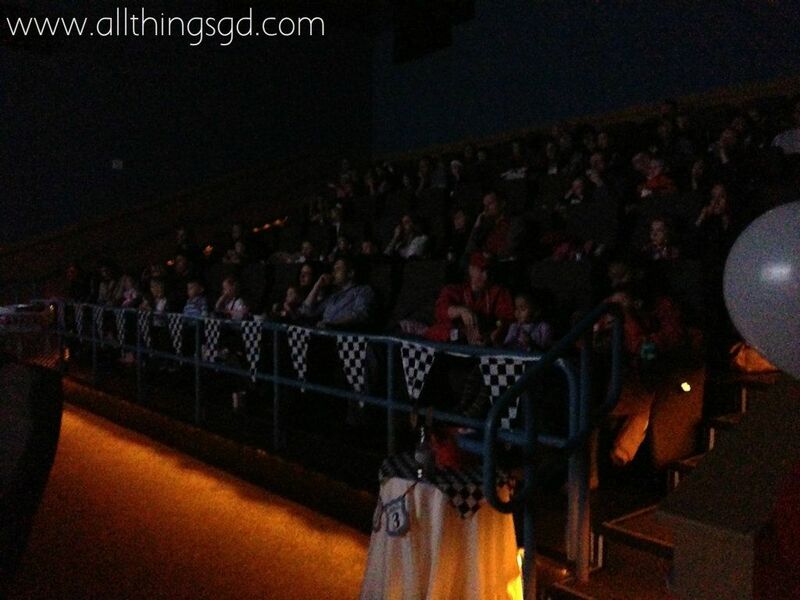 Nearly all of our friends have children (most have multiple children), and since we had a great big theater all to ourselves we invited them all and were thrilled to have 70 friends (32 of them kids) join us for Kate’s big birthday celebration! One of my favorite parts about Kate’s birthday party last year was seeing how excited the kids got when they walked in our house to see it transformed. 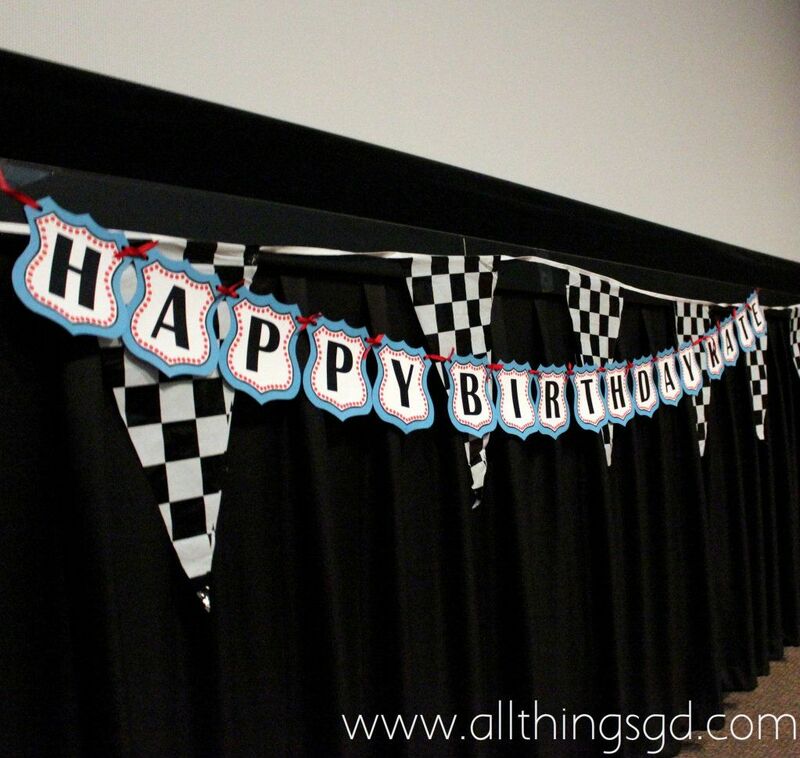 I wanted to bring that same excitement to this year’s party, so the first thing they got when they arrived were VIP “Pit Passes” that I made for each child’s entry into the party. 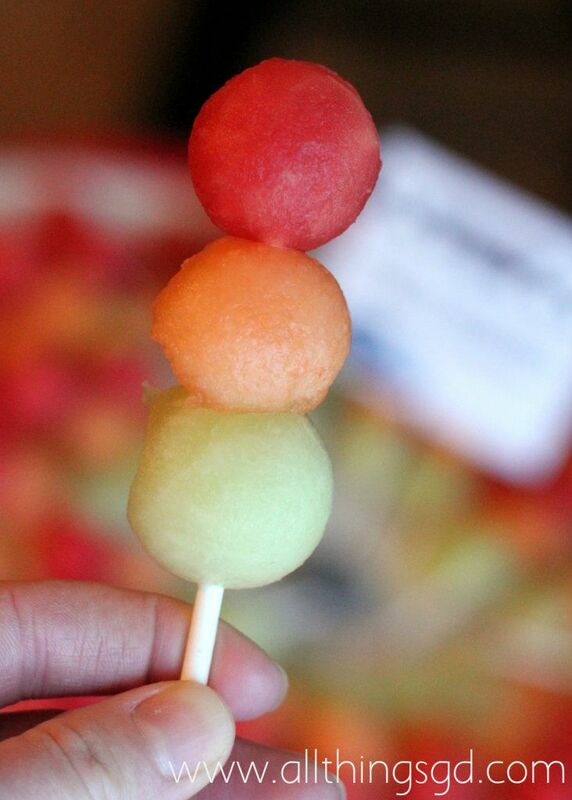 These were such a hit that even some adults were asking for them too! 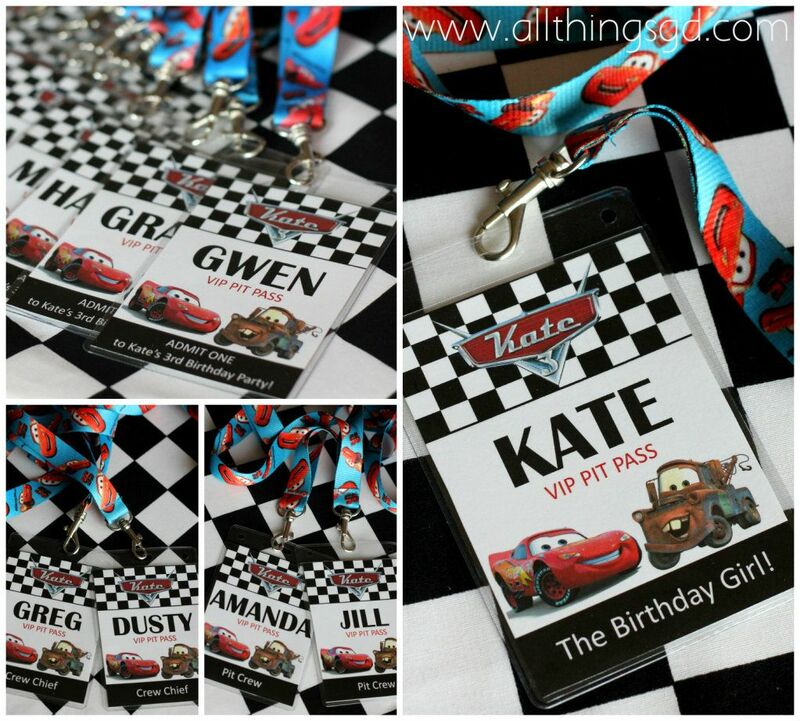 VIP Pit Passes for each little race fan that attended Kate’s 3rd birthday party! VIP Pit Passes for the kids, the birthday girl, and the crew! Kate, running into her birthday party! The first two cones in each line featured Lightening McQueen and Mater (Kate’s two favorite Cars characters) and after that each cone featured a picture of another character from the movie – all 16 of them! The last two cones in the line (there were 20 cones total) featured the Cars logo with Kate’s name and age (as seen at the top of the VIP passes above and in the food signs below). 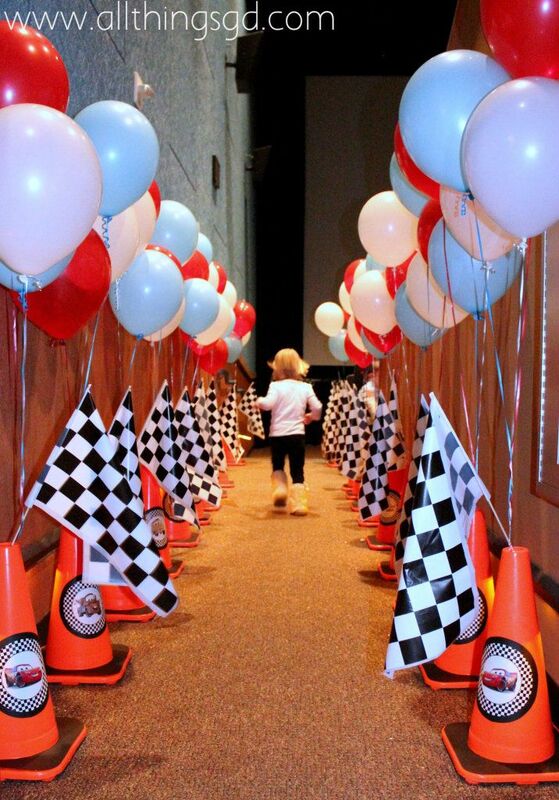 I decorated each safety cone with a character from the Cars movie and filled them with a racing flag and balloons. I made a video slideshow of Kate’s pictures from over the past three years (set to songs from the Cars movie) which played before the movie as guests arrived. 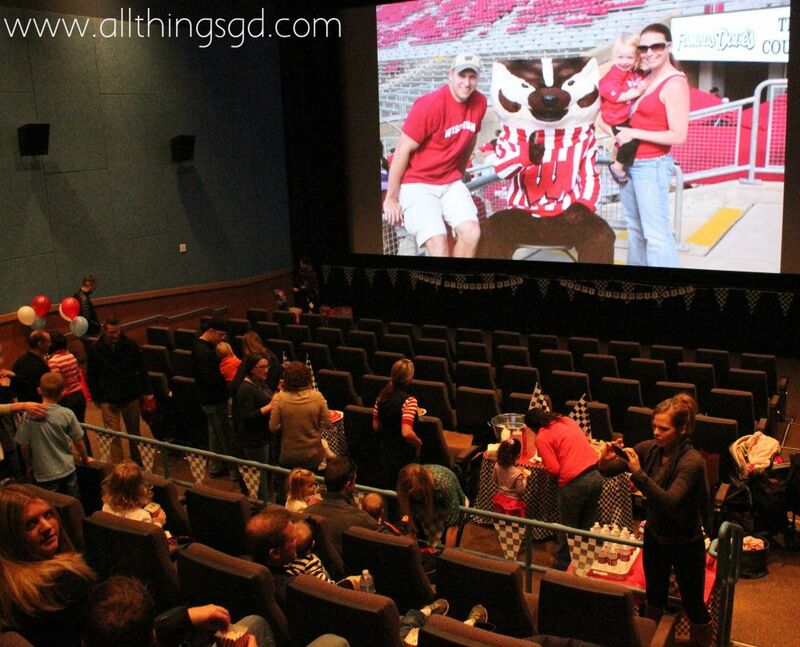 Kate got such a thrill seeing all those pictures of her up on the big screen! Kate’s 3rd birthday slideshow playing as guests arrived. The birthday girl, and some of her friends, with the best seats in the house! …with the birthday girl, front and center, and having a great time! 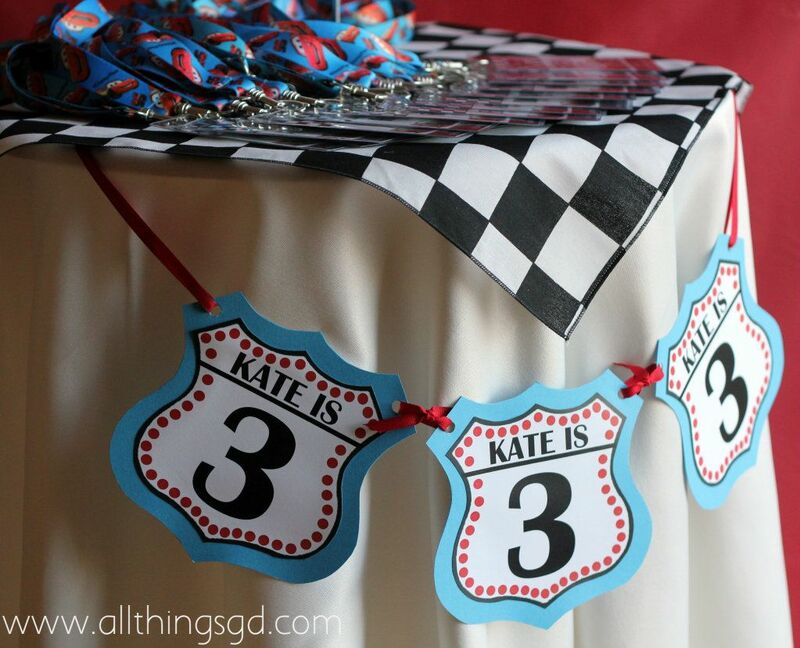 Birthday banners I made for Kate using the Route 66 road sign shape. 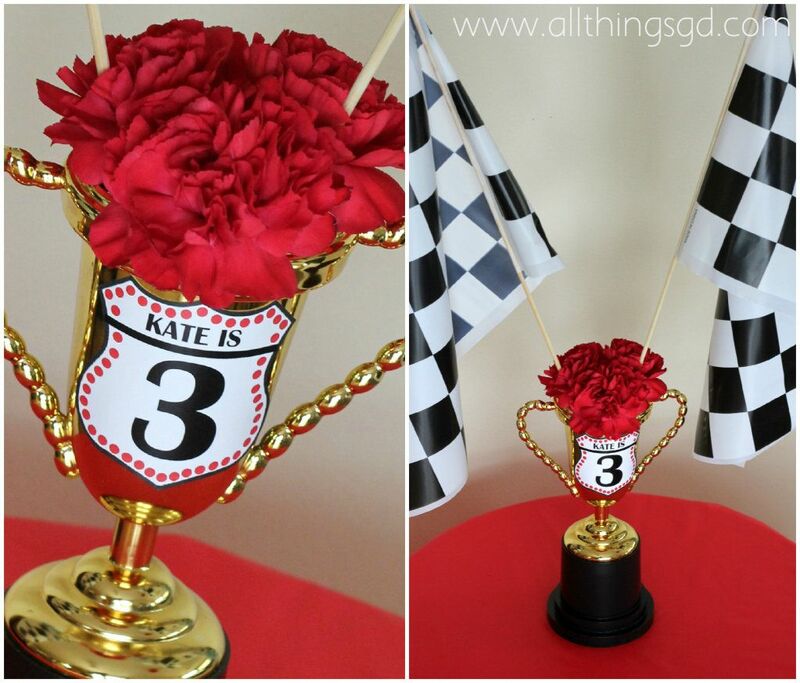 Kate’s “Piston Cup” centerpieces for the food tables. 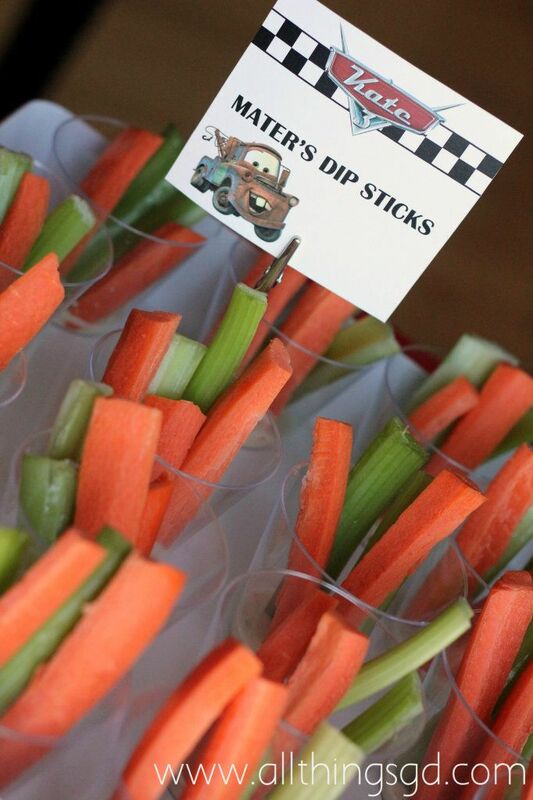 Knowing that kids would mostly be eating from plates (or bowls, which were another option) balanced on their laps, I focused on finger foods that wouldn’t need utensils or make big messes – and I had a blast coming up with fun Cars-themed foods! 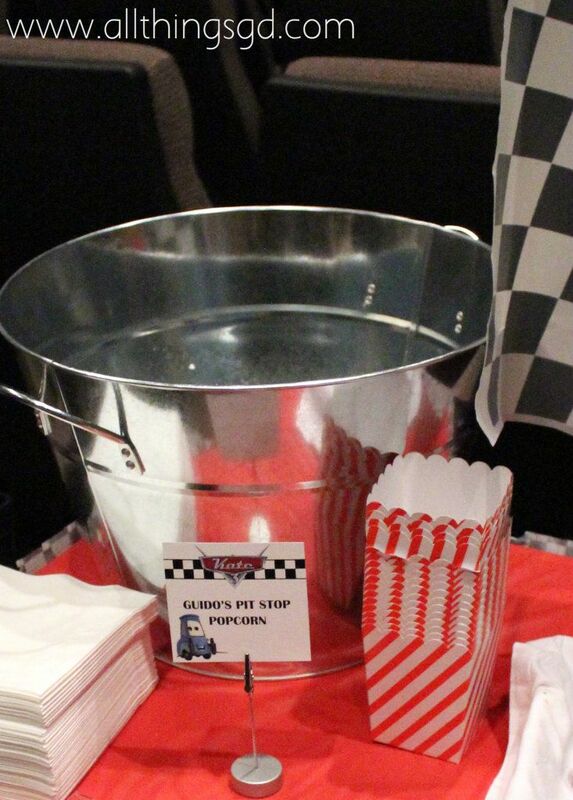 Guido’s Pit Stop Popcorn – a spot so hot I wasn’t able to get a picture of it until after the party when, sadly, the popcorn was all gone. Flo’s V8 Cafe Refueling Station – another post-party picture. That white bin was filled with juice. You’re just going to have to trust me on this. I set up a little “Car Wash” station across from the food tables for kids to wash up after they “filled up”! Car Wash Hand Wash & Sanitizing Station – Free with Fill-Up! 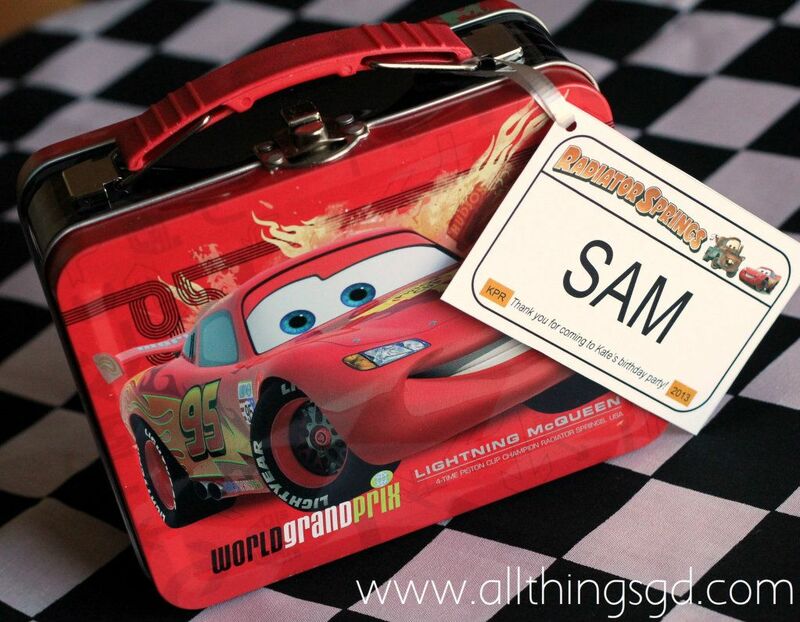 Kate’s birthday party favors: a Cars lunch box with a personalized Radiator Springs license plate for each child! The inside of Kate’s birthday party lunch box favors. 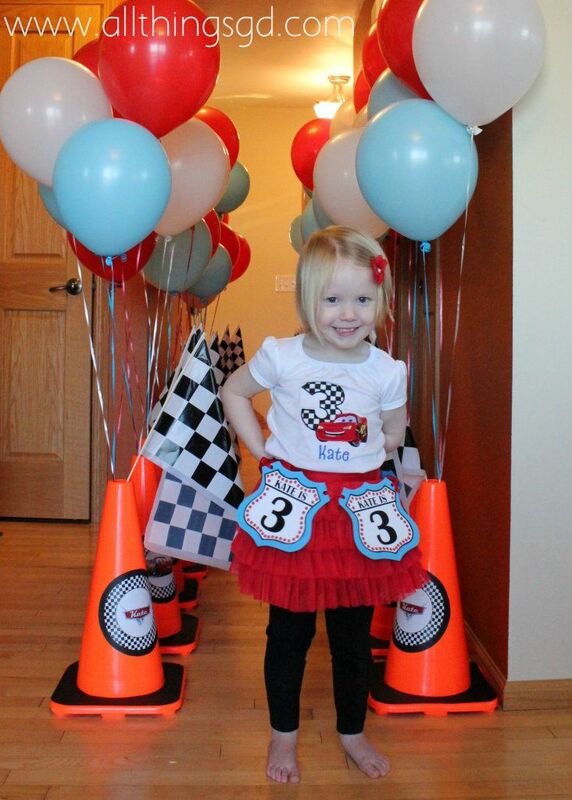 Kate’s 3rd birthday party was everything we hoped it would be! 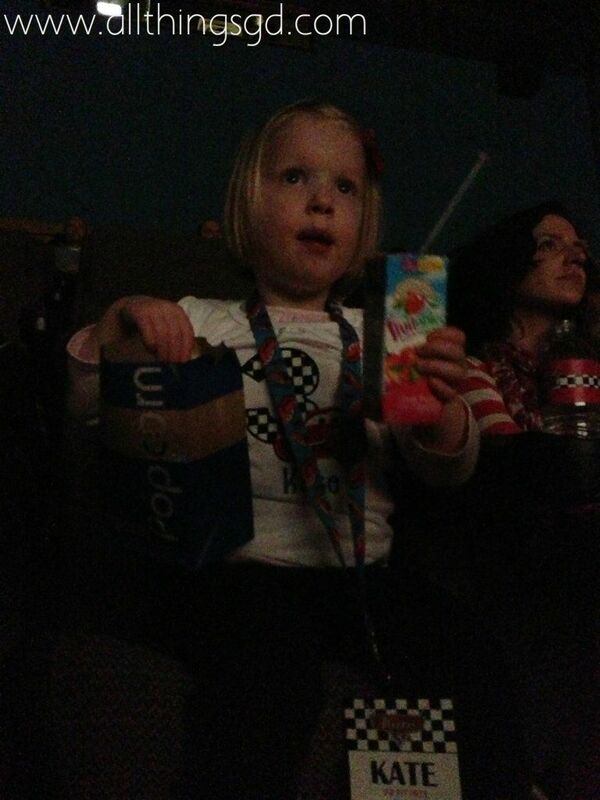 Kate was thrilled with all of her decorations, her favorite foods and treats, seeing all of her friends, and, of course, her first movie theater experience! Just as we hoped, it was a great way for us (and all of our friends with their kids!) to test out if Kate was ready to sit through an entire movie at the theater. Cars is a two hour movie and she (and many of her friends) started getting antsy around the 90 minute mark. 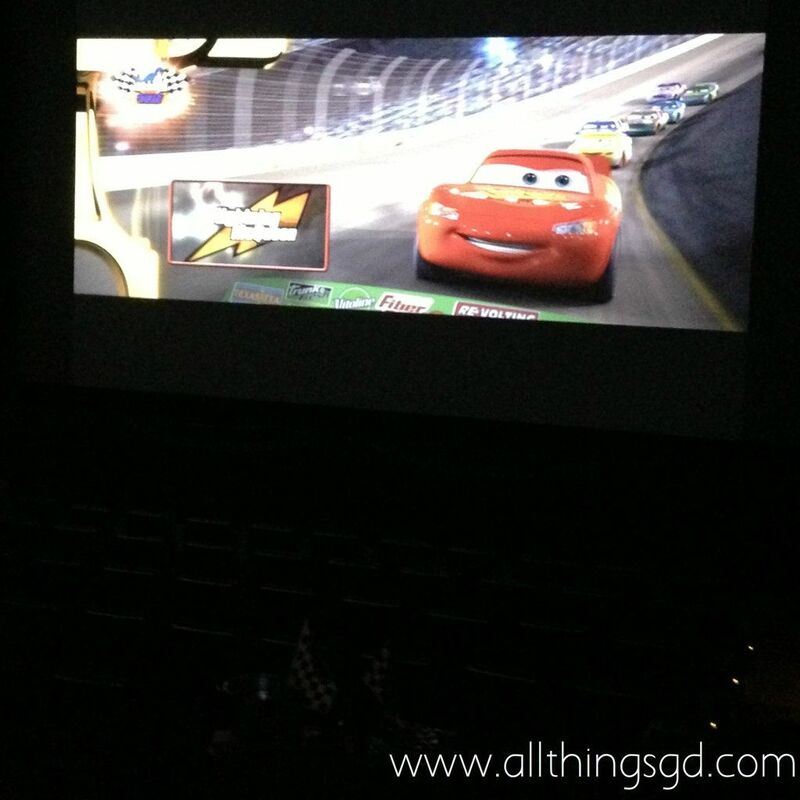 Luckily we had the theater all to ourselves, so they were able to get up and run around! Even though it was Kate’s biggest party to date, it was the most fun to plan – and come party time, it was surprisingly the least stressful and the most enjoyable of the three parties she’s had so far! We are so blessed with such a wonderful little girl to celebrate, and so many great friends and family members to celebrate her with us! Our wonderful little birthday girl, Kate! Want to see more? 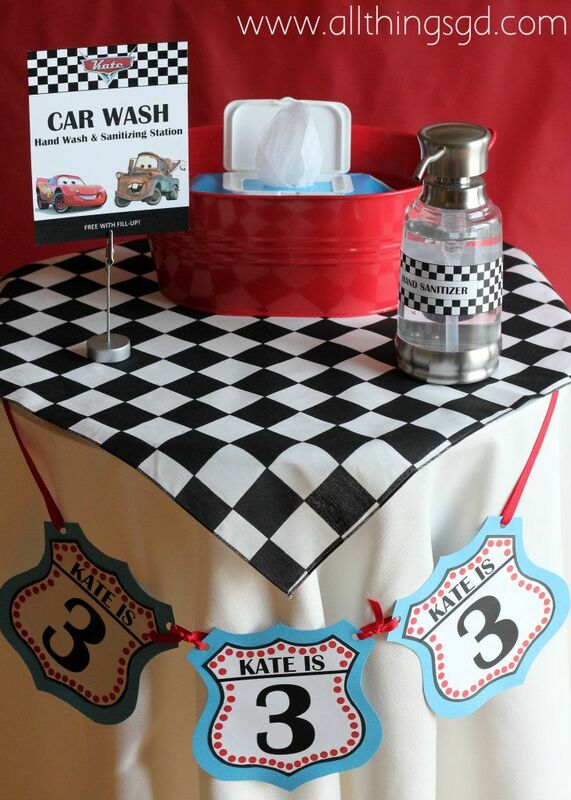 Check out my The Making of Kate’s Cars Themed Birthday Party post and my FREE Cars Birthday Party Printables! LOVE everything about this party!! What a great idea! Every part was perfect, way to go!! wow what a great party! How did you find a theater to play it? Did they use an actual 6 year old film, or could they get it digital? Or even just use your DVD? Awesome idea! I do have a question for you: Do you provide other foods for adults? This is something I struggle with at every birthday party, and often find myself coming up with 2 menus. 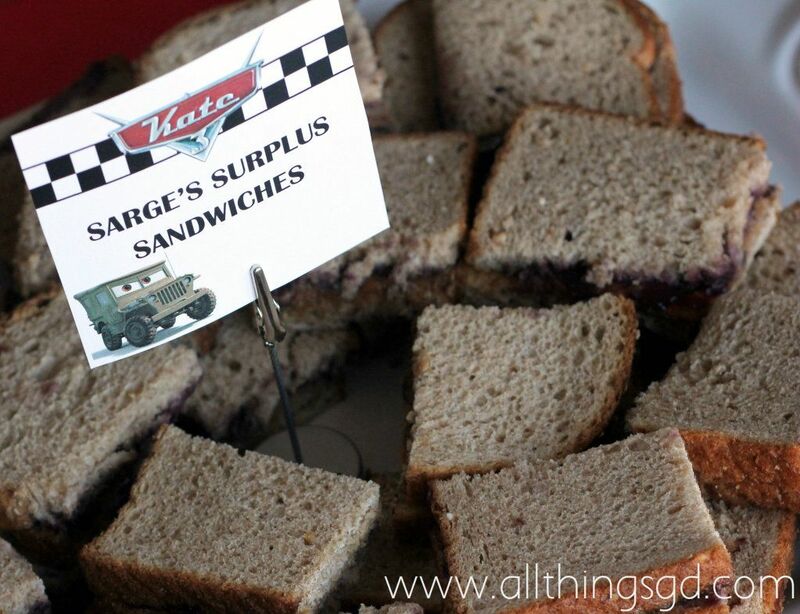 (PB &J’s for the kids, and then I usually buy a wrap tray or something for adults) Just curious how you handle that. Thanks! Really, you’ve inspired me to figure out if we can do this in our area! My kids would LOVE it! So. Awesome. I am super jealous of your 60 balloons! When I tried to get cow balloons done for my son’s first birthday two months ago we were told there was a helium shortage and places here would only blow up mylar balloons. Crazy! I’m curious about the same things Robin asked! What an amazing party! Great job. WOW!!! this party looks amazing! i love all the decor and the snacks and would love to know about the movie, too! OMG I LOVE IT!!!! Soooooo cute! GREAT JOB MOM! Love this! 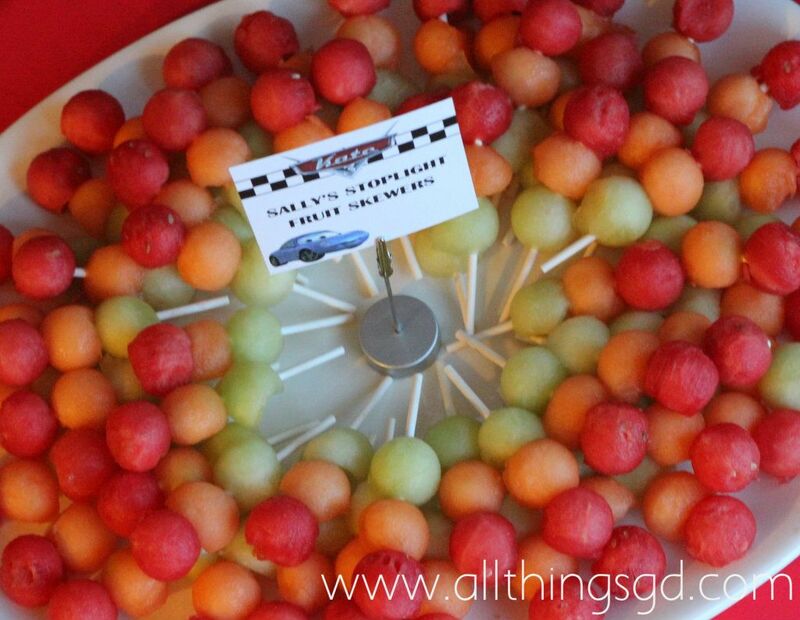 My 3 year old has become a Cars nut lately and this birthday party is right up his alley! I just might be referencing this for ideas for his 4th birthday party next year. Fabulous ideas!! 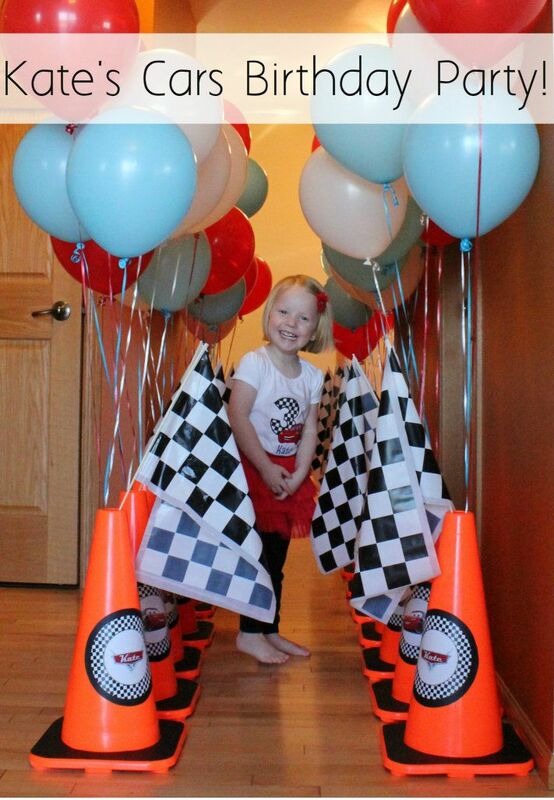 This is seriously THE CUTEST idea for a kid bday party I have EVER seen!! WOW!! Kate is sure a cutie! What a great outfit she had for the day!! This is SO CUTE!!!!!!!!!!! I love it! WOW! This is definitely your specialty—party planning! I wish Kate had a birthday every month so I could see all your creativity shine! all i can say is WOW! i love a lot of these ideas. can you address in your follow up post how you handle the treat “lunchboxes” or bags for different ages? this is the hardest hard for me as we have so many kids ranging from 7 months to 14 years old. Woman! You need to start a side job as a party planner! This is crazy good. 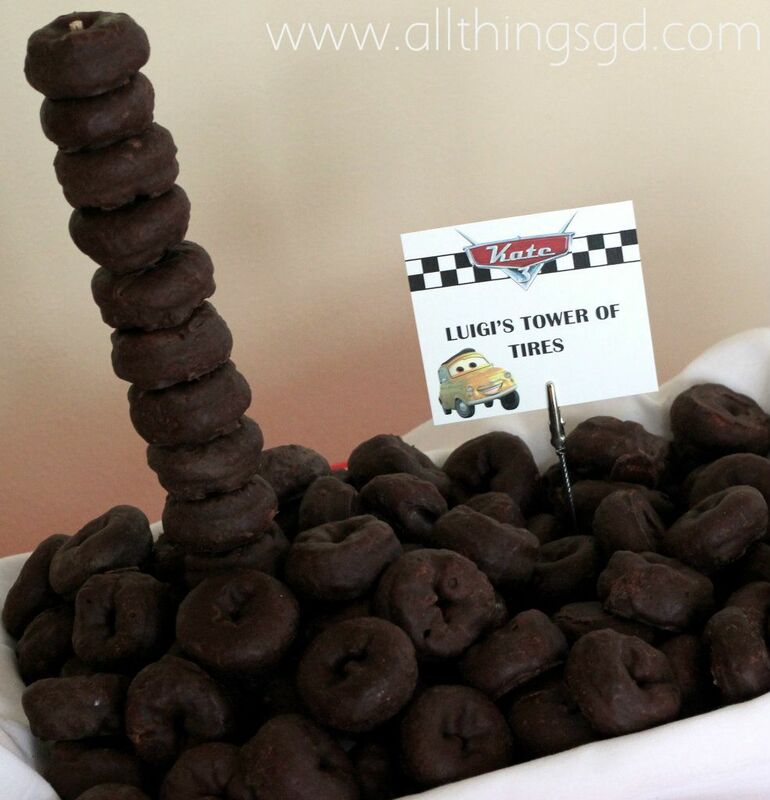 We’re doing a Radio Flyer theme for Charlie’s birthday this Sunday, so I love the idea of using chocolate covered donuts as little tires. So cute! This is beyond the coolest birthday party ever! Kate is such a lucky little girl to have the most amazingly creative mom around! I didn’t think last year’s Sesame Street party could be topped, but you’ve outdone yourself. What are you going to do for her Sweet 16 party???? My son would LOVE this party!!!! Thanks for posting! Holy crap!! Are you kidding me?! Ok, you have officially made me a believer in themed kids parties now:) Amazing. The movie theater thing is insane! I can’t wait to hear all about how you set this thing up. The walk way in with the cones and balloons is killer too. Such great ideas you have in here, Dusty, and super attention to detail! And somehow I love it all more because its a car party for a girl (c’mon, she’s wearing a tutu and a shirt with a car on it – so cool!!)!!! Maura loves Cars, Mater is by far her fave, followed by “Queen” as she calls him. Big kudos, you are a wonderful mom!! AMAZING party D! The theater and all of the fun themed foods AND The little lunch boxes for favors?! Shut.up. Kate is one lucky little girl! What an awesome party! I love the movie Cars too. You did an amazing job! Thanks for sharing. What an awesome themed party! I love your attention to detail – you can tell you really gave a lot of thought about everything. Great job – Kate’s a lucky girl! Thank you so much, everyone! Your sweet comments have me grinning from ear to ear. It was such a fun party to throw and it’s also so much fun to share! @Robin: I’m glad you asked that b/c I actually wasn’t planning to address it in my follow-up post. The theater we booked let us bring in our own DVD, which (as I was looking into making this party happen) I discovered was the only way I’d be able to have a Disney/Pixar movie that wasn’t currently in theaters shown since Disney locks their movies (reels, too) up in “the vault” and will not release them to theaters. @Linds102: Another great question I wouldn’t have thought to touch on! The food you see in this post is the only food we had. In our evite we told families that “light snacks and refreshments” would be provided, so I was really trying to keep it in check and not go over the top with food. Plus the theater has an amazing concession stand that’s more like a restaurant than a theater so guests could’ve purchased more substantial (or “grown up”) food if they wanted to. From what we could see, the adults who were hungry were just fine with the good ol’ PB&J. @Meg: I heard about that from some other readers when I first posted about my balloon saga on Instagram and Facebook – crazy! I wonder if that’s a regional thing, b/c it wasn’t a problem at all for me in WI. Thank you, Sally! My friend Kent (Etsy Shop: Peachy Keen Designs) made her embroidered Cars shirt. It turned out so cute! @Deborah: Once a year is plenty for me, lol! It’s such much fun to do, but damn I lose a lot of sleep leading up to these things! @Maria: Great question. I’ll be sure to address it in my follow-up post. Thanks! @Liz: I can’t wait to see pics of Charlie’s party – such a cute theme! @Kelly Williams: Girrrrl, by the time Kate’s 16 I’ll be too old and tired to do anything like this! I’ll probably just give her a $50 and drop her off at the mall, hahaha. Thank you so much, everyone! Your comments are so much fun to read and I’m filled to the brim to hear such nice feedback. It was such a fun day, and it’s been so much fun to share with you all, too! This is the cutest party ever! My boy and your Kate are identical in their cars plus MnMs obsessions. he is turning 2 in March and I may need to copy this exactly. Great job Mama!!! WOW! I’m with a few other people, I didn’t know how you could have topped last year’s birthday party and yet you did! Amazing job! Kate is one lucky little girl to have such a creative mom and a willing dad to let her mom do what she wants in the party planning area! 😉 I will be anxiously awaiting your follow up to planning such an awesome party. An amazing party, D! I’m excited to learn more from your follow-up post. One question I have is, are you a graphic designer or do you have a graphic design background? I can dream up stuff like the Route 66-shaped signs, but I don’t have the knowledge to actually implement them. So off to Etsy I go, which is great, but can get expensive! I’m just wondering how you DIY it all. My daughter’s second birthday is tomorrow and she chose helicopters as her theme. No princesses or ladybugs here! She’s so excited to have a “hoppo” shirt, decorations, etc. It was hard to find girly helicopter stuff, but I made it happen! Dusty, I am typically just a lurker and LOVE your blog! But I couldn’t hold back my comment on this birthday party! YOU ARE FREAKING MOM OF THE YEAR!! I am so happy to have the opportunities to read your blog each week! What an adorable party! I love Kate’s red tutu adds the perfect girly touch! I can’t wait for the post with the instructions on how you made everything. I’d love to know where you got the orange construction cones, I’m having a construction theme party for my son and these would be great! Wow. Wow, wow and wow. You did an amazing job! You are my party-planning idol. This party had given me inspiration for my daughters 2nd birthday. She is not quite old enough for movies but her favorite toys are cars. I love your blog. You did an excellent job with everything! Glad you guys, and especially Kate, enjoyed it! Awesome party! I have my eye on a few of your ideas, especially the food signs and the license plate tags for the lunch boxes. When do you anticipate to have the info on how you did everything? WOW…WOW…WOW!!! You ROCK!! Kate’s party looks amazing. Your ideas are so inspirational! I love to plan parties and I get a lot of inspiration from talented moms like you. I’d love to know how you made the food labels and VIP passes. I look forward to reading your follow-up post. 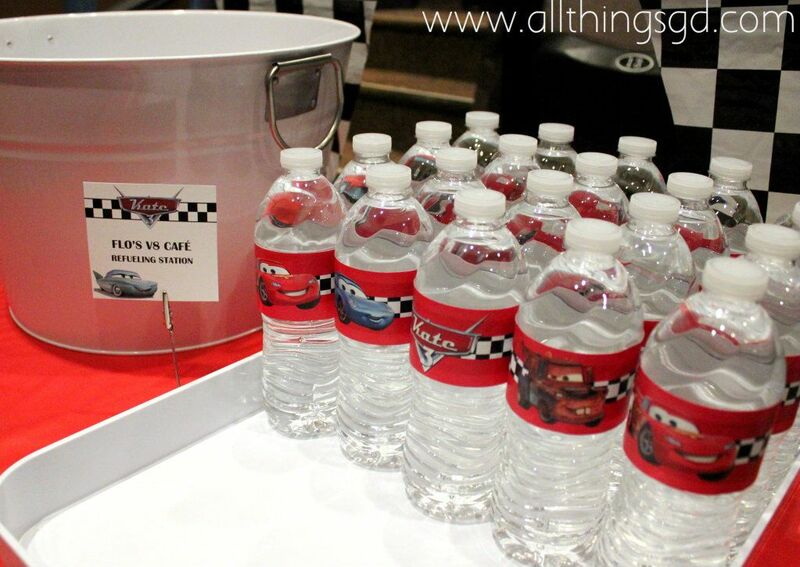 I’m planning my grandson’s 3rd birthday party and of course it will be a Disney Car themed party. love all the work you put into this party. can’t wait to se the follow-up post on how you made all the labels and passes. will you post any of the images? Thank you so much everyone! 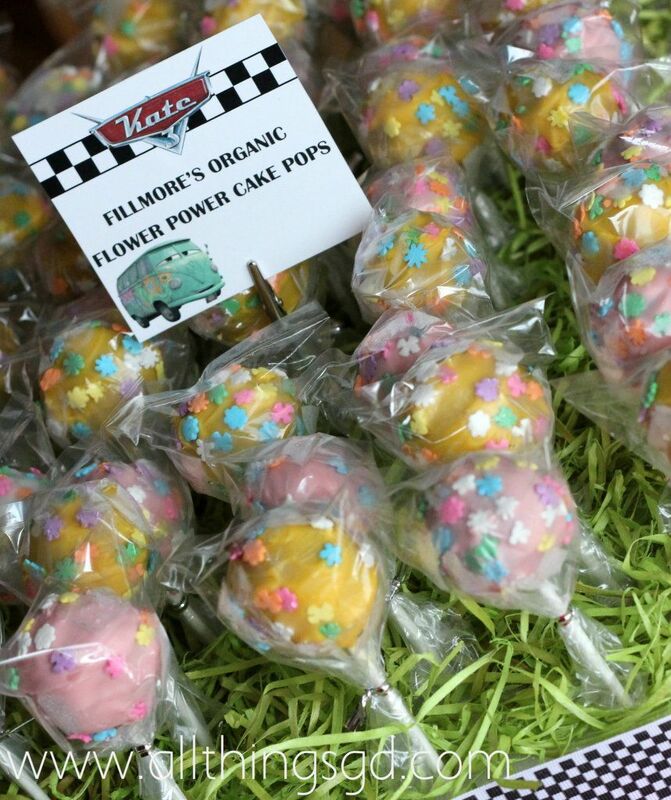 I’m currently finalizing my “The Making of Kate’s Cars Themed Birthday Party” post and hope to have it published tomorrow! Thanks so much for your patience! Hi Charmaine, I got the orange safety cones from Home Depot. Where order things from in the cars party themes? Thank you so much for the free print outs. This is going to save me so much time for my little guy’s Racecar 4th birthday party in a month that I am just starting on. Ooops! Snuck up on me. I need to get the invitations in the mail TODAY! I’m using some of this stuff to create them right now. Thanks. That was very kind of you. It’s my pleasure, Amber! 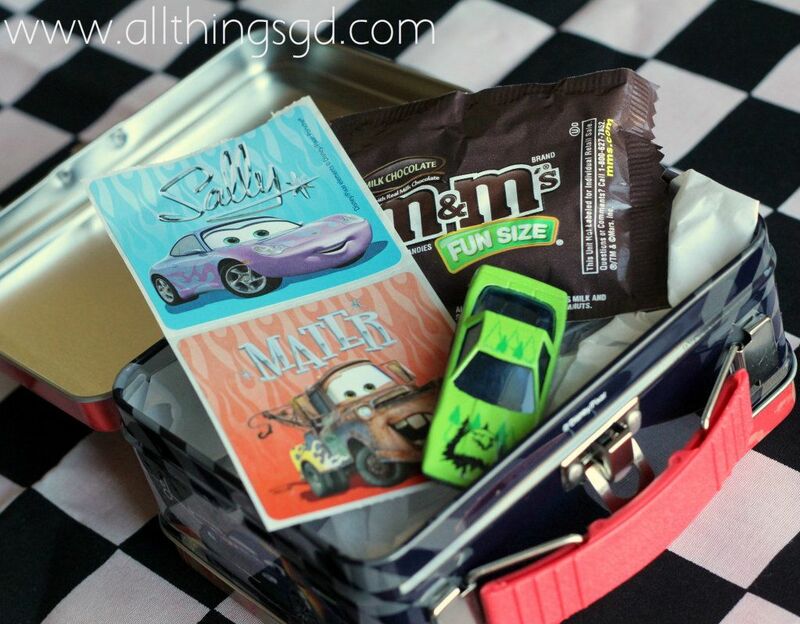 Good luck to you with your little guy’s race car party – I’m sure it will be a hit! hi. i love the trophy. where did u purchase or how did you do the label for the trophy? pls advise. Thank you so much! Good luck to you with your son’s birthday party – I’m sure he will have a blast! How did you get the fonts. Love this btw.